Working as a psychologist and business management consultant, there is no question that people need structure to successfully accomplish their goals. But structure must be as carefully implemented as the support side of the equation. Let me explain. People can actually like rules, guidelines, requirements and goals when they are done in a particular way. In my earlier posts on the need to nurture staff I stated that people are incredibly sensitive to rejection. Rejection through the experience of personal criticism and failure are primary worries for people at work. Management can buffer worries about rejection by offering structure implemented in a supportive and depersonalized manner. You see, the policies and procedures, and the ultimate outcomes of the organization are not personal. They need to be achieved because they are there; because they constitute the purpose of the organization. It is not because the staff isn’t important that the goals must be accomplished. And people can easily understand this. Consequently you apply structure universally and in an impersonal, across-the-board manner for optimal effect. When the rules apply to everyone, people accept them—even if the rules require them to change their behavior pretty dramatically. The rules constitute the way business is conducted. Of course, management has the critical role of reviewing the performance of its employees. Most importantly, this is not a personal judgment, but a review of how closely the employee met the requirements of their role in the organization. The review attempts to clarify the needs of the role and performance criteria attached to it. Employees have a difficult time not personalizing this process. They tend to equate comments about their performance with their actual personal value as a human being. Your job becomes separating the performance from the person. Having the structure be depersonalized allows management to really get behind their people with maximal support. The message becomes, “How can we help you achieve your goals for the company and be successful here?” Management cares for people because they want their workers to be successful – for themselves and the company. Based on the People Side of Business, you have been hearing from me about the critical need to provide support for your employees. You have heard how people are not entirely rational beings, that they need nurturance, a family-like atmosphere, and an opportunity for growth and development. But support is only half the equation. As a critical complement to support, people also need structure. What do I mean by the term structure? Structure is the framework of rules and processes necessary to accomplish the goals of your organization. It includes that boring policy and procedure manual people hate to put together. Structure provides clarity about performance and necessary outcomes. Structure provides rewards and consequences for behavior. You see, taking care of people requires not only that they are nurtured, but that they understand the rules of the game and are rewarded for playing it well. An organization without structure is disorganized and does not meet its goals. It lacks clarity of purpose, efficient processes, and necessary outcomes. Everyone in the organization should understand that they are there to meet the targeted outcomes, and that they will be held accountable to them. Too many leaders and managers in business think that the notion of accountability and structure is in opposition to that of support and nurturance. From an organizational point of view, structure serves the same goals as support. Boundaries liberate as well as limit. When staff members are clear about limits, they know the arena in which they are free to act, explore, and become creative. Clarity of structure helps people become more secure and autonomous in their roles. And autonomous people are free to apply their best emotional and rational thinking to solving organizational problems. In fact, a safe and supportive environment can only exist when an organization provides clear limits and accountability. 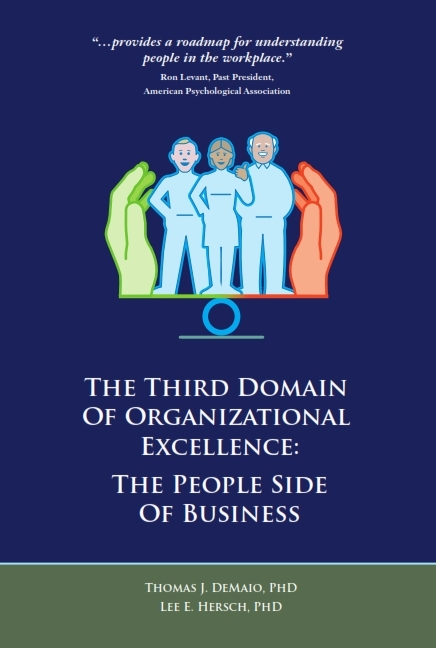 The need for structure is the fifth principle of the People Side of Business. More about structure in my coming blogs. Supporting a work-life balance in your organization is tricky. There are forces that make the implementation of a work-life balance mentality difficult, especially given the varying circumstances of individuals and organizations. Obviously you want your workers to be as productive as possible, especially in these difficult economic times. In the short run, work-life balance appears counter to your bottom line goals. Dedicated employees working extra hours can bring the profit, or survival, your company so desperately needs. But like any runner knows, the pace for a 5K race cannot be sustained over the course of a marathon. The runner is eventually exhausted only to drop out of the race. People also have their own propensity to work enough to complete their jobs. When the workload grows, as happens during a period of downsizing, people attempt accomplish whatever is handed to them. The best employees will tend to sacrifice themselves (and their own families) to accomplish their tasks. Telling them to have a work-life balance while simultaneously piling on can seem to send a contradictory message. Individuals meet their needs in different ways. Some people have families at home that require significant energy: like having children, aging parents, or members with illnesses. Some people meet more of their social needs at work and are alone at home. Work-life balance will look different to each employee. Most importantly, the notion of a work-life balance establishes a cultural position. It conveys that the company wants its employees to achieve mastery at work and at home. It conveys that the company cares and does not want to take advantage of workers. It conveys that while the company needs to run a business, it can do so with flexibility and consideration of employee needs. The organization will convey these messages through supervision, through employee policies, and through programs that demonstrate a commitment to balance. It will do this with a healthy respect for unique individual differences. Organizations will offer continuing education, career development, flexible hours, and opportunities for advancement commensurate with its resources. Remember, it is fundamentally not about how lavish the programs are, but how the organization conveys that it wants employees to work sensibly, and have a balance. People want an opportunity for growth and development in order to achieve mastery. So, how does this principle relate to having a work-life balance? They relate because people seek mastery in both their personal and professional lives. When they are unable to achieve mastery in their personal lives, their ability to achieve mastery in their professional lives suffers. All too often today’s workers spend as long as necessary getting their jobs done. This is particularly true of men. Putting in 50, 60, and 70 hour weeks is not uncommon, especially in a down economy. Home life suffers and, ultimately, work suffers. Workers simply cannot make a sustained contribution if they are exhausted. How much mastery do you suppose they feel when their lives are out of balance? People rise to become leaders and managers because they are committed people. Whether it is the expectation of their organization or their own personal drive, it doesn’t take much for them to overwork. This is why the organization must have policies that address the problem and protect their employees. It is more sensible for organizations to encourage autonomy and creativity rather than endurance; you know, work smarter, not harder. It is a complicated issue because the needs of individuals differ. For people in families, especially those with children, there is a great need for protection. They have the most trouble with extended hours, and they cannot meet the same work expectations of others without families. Companies that make demands of their workers at the expense of family involvement, whatever that is, will pay a price in unhappy and less productive workers. The organization benefits by encouraging growth in the personal lives of its employees since this will enhance their sense of well-being and productivity. People want to feel mastery at their jobs and in their personal lives. To achieve this they need a balance. Many leaders and managers think of employee growth and development as being about improving job skills. And, yes that is true, but it is not the important part. When employees are growing so is your company. When employees are not growing, well, you can guess what will happen to your company. You see, when you foster employee growth and development, you are tapping the problem-solving capacity of all your employees. All too often an organization is powered by a few key “leaders” who establish the solutions to all problems. Workers then carry out the solution of leadership. Such a process uses only a fraction of the brain power available in the organization for goal attainment. Most organizations are chocked full of competent individuals who learn their own small piece of the puzzle. This piece they can improve better than anyone else. And, it is more than just brain power. People work better when they participate in problem-solving. They like figuring things out and feeling like they can master their world. To do someone else’s solution may be required work, but it is not fully theirs. People are more likely to become invested in their own answers and give it their all. When people do get a chance to contribute by participating in problem-solving they also tend to identify more personally with and “own” the company. The company becomes theirs because it is their solutions being implemented. It is a source of pride, accomplishment, and self-esteem. People with pride in their organization don’t need management; they want to achieve the goals of the company. They become race horses toward the finish line rather than donkeys hauling a load. They are more autonomous in their efforts, self correcting with mistakes, and engaged by their jobs. Finally, workers who have the opportunity for growth and development are self replacing. They grow, learn new skills, and can take the place of those who leave. With employee growth and development there is increased flexibility and sustainability. The job as a manager and leader is to create the environment that fosters the growth of employees. The reward is rich for everyone- leaders, employees, and the company. Facilitating employee growth and development is not the same as merely providing training opportunities. It is about creating a culture where people are encouraged to learn, grow, and advance. In such a culture everyone is seen as an asset to the organization. Everyone is expected to make a contribution both to the achievements and processes of the company. Employees must be treated as adults who can figure out new problems in the workplace. This sounds obvious, doesn’t it? You’d be surprised. All too often management wants to be seen as the font of all knowledge and the controller of all outcomes. As with all humans, they like to be important, sometimes morphing into parental supervisory roles. But this is a huge mistake. Management must see itself in partnership with employees. The partnership fosters an adult to adult relationship which in turn creates the atmosphere most supportive of employee growth. This is what we mean at DeMaio Psychology when we talk about a safe and supportive environment. In this environment there is an active effort by leadership to reduce fears of failure and rejection. It was Deming who made it clear that we must “stamp out fear” in the workplace. Fear undermines the initiative to seek mastery by making growth seem dangerous. People will not take the risks of growth when there are personal dangers of judgment, retribution, or criticism. None of this is to say that people shouldn’t be held accountable to work goals. The process of feedback and evaluation can and should be accomplished in a supportive manner; it is not personal. Feedback is provided in the spirit of wanting the employee to succeed. It conveys to the employee that their performance is necessary for organizational success. Managers can facilitate employee growth and development by making it part of their employees’ job goals. When managers sit down and review their employees’ growth it conveys caring as well as cultural expectation. In these meetings appropriate goals can be determined; ones which are to be achieved in incremental, manageable steps. Growth that is incremental is experienced as safe and attainable. At HerschDeMaio we believe employees want to learn and grow in their jobs. We aren’t just optimistic about employees; as psychologists we know this about human nature. People are hardwired to be curious, to learn new things, and to solve problems. They want to figure out new things. On the job employees look for opportunities for growth so that they can achieve mastery. Our ancestors survived and flourished in harsh environments not simply because they had reasoning skills, but because they found satisfaction in using them. It’s why people are drawn to puzzles. They enjoy proving that they can master and manage their surroundings. Research consistently identifies the attainment of mastery as the most important source of job satisfaction. When growth and development are fostered, the employees move toward being autonomous problem solvers, participating in the growth of the business. They need less push, less management, and less control. They function more like adults, capable of teaming for high performance. Of course, any experienced manager would argue that not every employee is willing to grow. And that is true. For some workers the desire for mastery is blunted, usually because they are afraid of failure and rejection. These employees opt for a safe and secure method of doing their jobs, and they cling to what they know. The responsibility of leaders and managers is not only to create opportunities for growth and mastery, but to provide the staff with the support they need to take advantage of it. They create a culture that encourages the naturally desired acquisition and integration of new skills. Creating the culture that facilitates the desire for growth and master is a function of our first three principles: providing acceptance, nurturance and, a family-like atmosphere. When this kind of support is available in the work environment, employees can optimally learn, grow and master the tasks the organization needs to accomplish. More on the impact of this principle next time.